Hello! I'm lvl 68 and just got my studio (little behind, was questing xD) and am picking up quests around the city center. I recently picked up the Leaves of Four Seasons quest (Lvl 40 quest), and i've found some really old guides on it so understand the premise (kill seasonal agrints that spawn during the seasons in-game, get leaves), but it doesn't seem to be working to me: I've killed at least 6 spawns of the Spring Agrint, and gotten nothing. No Spring Leaf. I understand that the Seasonal Agrints wouldn't drop normal drops for me, since i'm over-lvled for the quest- but they should still drop the quest leaves, right? I'm just wondering if anyone has any experience with this quest recently, completing it when over-lvled or if this is a known glitch? Changed title to better convey my question! Just as an update: the Spring Agrints were simply dissolving upon being killed. The Wintery Agrints are now spawning again (?) and they have a collection window upon being killed, but the window is empty/nothing can be looted for them. This is for the Leaves/Crystals of Four Seasons and Fertile Deal (aether gems) quests, both of which indicate that the quest items should be Agrint drops. Oh, I see your problem. You are killing the wrong Agrints. There are two versions, you need the first one. Seasonal Agrints: Level 60 Legendary bosses. Wintery and Springy Agrints: Level 65 normal mobs. Seasonal Agrints spawn on the 1st day of the in-game month (12 am). 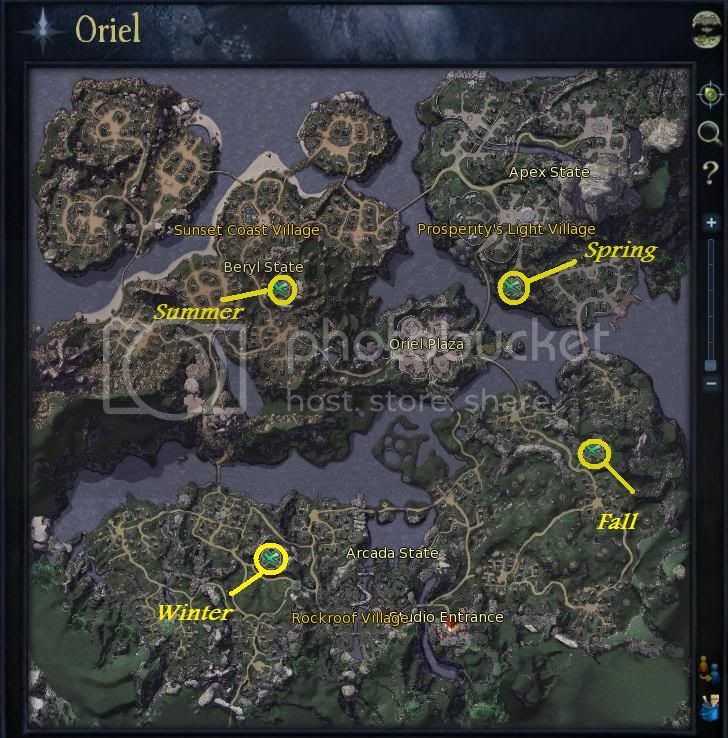 There are 4 possible locations, one for each season, which will only hold one of the four Agrints. Obviously, northern hemisphere seasons. Soloing these can take a while sometimes, as every attack deals only 1 damage, but they are really easy to deal with. The items you need drop from these. You then have the other Agrints. These are for the level 65 Daevanion questline. They are always up, changing between Wintery and Springy between day and night. These have nothing to do with the quests you need, so you ignore them.